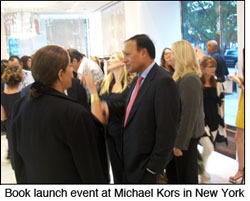 An impressive variety of people believe in Dr. Mosaraf Ali and his healing skills. His grateful, smiling patients include villagers at his free clinic in the Himalayas; Prince Charles, Morgan Freeman, Tico Torres of Bon Jovi; guests at his London and Tuscany health centers, and thousands of others. Tall and friendly, with a kind and caring manner, Dr. Ali likes to share — in medical detail, yet with simplicity — the key to his curative success: the neck. The basic concept of his new book The Neck Connection, and 25 years of putting it into practice, is this: the carotid artery, located in the front of the neck, supplies blood to the conscious, or voluntary, brain. The part that thinks and makes decisions. The vertebral arteries and veins, however, nourish the "subconscious brain," the part that controls all the automatic functions of the body. Without this part of the brain, nothing in the body can work. That's why nature has protected these vertebral arteries so carefully. And if blood flow is impeded for any reason — stress, accidents, illness — it's not good. On the other hand, when blood to the subconscious brain is flowing correctly again, serious problems can be cured, and well-being can be greatly improved. Dr. Ali has had remarkable results using his special treatments that involve massage, diet, and herbs. "Problems around the neck cause psychological, emotional, and physical problems. By improving the blood flow, it should reinstate all those functions" explains Dr. Ali. He's onto something good. Really good. 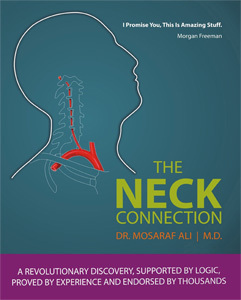 Based in London, and a bestselling author in Europe, Dr. Ali visits New York to see patients, to appear as a guest on the Dr. Oz Show, as an expert on Sharecare.com, and to talk about The Neck Connection, which is available in paperback as well as on Kindle. A members-only website is in the planning as well, wherein people can submit their health questions. He's also seeking collaboration with an American medical university that can conduct research on his "thesis." The top medical researchers could, for example, apply the latest scanning techniques for closer examination of the vertebral arteries. Ultimately, he would like to teach his method to more doctors so that more patients can be helped. "I came out with this, which is not fundamental science; it's logic-based," says Ali. "It's not physics, chemistry, mathematics, biology. It's based on logic. Socrates, Plato, Aristotle — they all used logic. They didn't know what physics was. They didn't know what chemistry was. So, I'm going back to the old-fashioned way of using logic to build a case." Lese Dunton: Using logic, but also backed up by your many successful case histories over many years. Dr. Ali: It will be very difficult for doctors to prove I'm wrong in all this because 25 years is a long, long period. What can I do in my lifetime? Am I going to treat all of America? I want to start training. My brothers are trained in this. All we need to do is to have a proper course. A lot of this old, traditional information had been lost because fathers would hand it down to their eldest children. In the East, a lot of it was lost. I want to leave it for posterity. The only way I can do it is to raise the profile for international acceptance; research it. LD: Your book can educate both patients and doctors. DA: It's a book to stay. People will begin to realize how the neck is connected to health. The idea is the blood flow. It's very simple.